Mars gets a lot of press when we talk about colonizing another world. But it seems that Saturn’s moon Titan may also be a pretty good bet. If we’re going to venture out beyond our home planet and start building colonies elsewhere, then one of the essential resources we’re going to need is energy – and a new study says Saturn’s largest moon, Titan, has it in abundance. “Once propulsion challenges are overcome, allowing humans to travel great distances quickly without incurring significant radiation damage, Saturn’s moon is the optimal location in the solar system for an off-Earth human settlement,” write the scientists. At the moment though, Titan’s geology is too much of a mystery to be sure the nuclear power option would work. 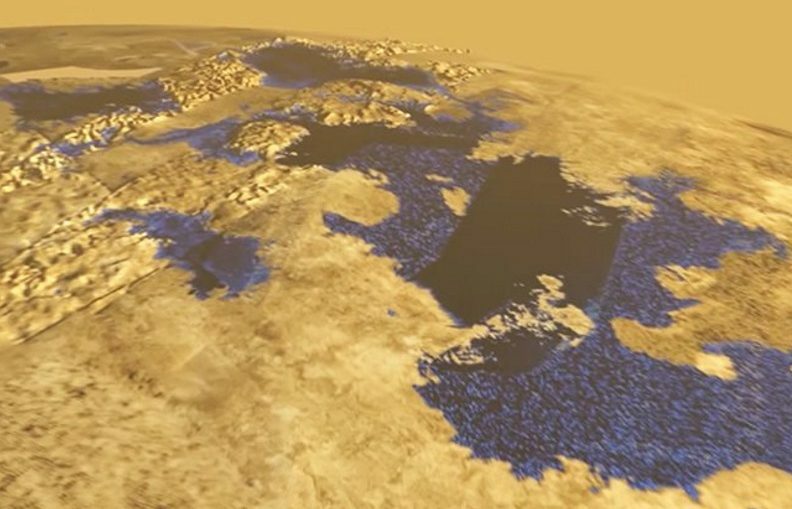 What we do know is that there’s plenty of methane on Titan – oceans of the stuff – which could provide rocket fuel as well as hydropower options. While the low-lying seas and a lack of rain mean rivers aren’t often found on the moon, tidal power is a possibility. “The Throat of Kraken is basically the Strait of Gibraltar,” planetary scientist Ralph Lorenz from Johns Hopkins University, who wasn’t involved in the research, told New Scientist. As for wind power, Titan does have strong winds in its upper atmosphere, according to measurements made by the Huygens probe. At the moment though, we don’t have the technology to build floating wind turbines that could get up that high. Indeed, one of the study’s running themes is the need to refine and improve the technology we have here on Earth, from solar panels to turbines, ready for use on other planets. With hydrocarbon fuels pretty much out of the question due to the lack of oxygen required to combust them, we’re going to have to rely on these other options to support a base on Titan. The study authors admit that they’ve skipped over some details in their work – we just don’t know that much about Titan right now – but their report is a useful first step in working out how to make life liveable up on Saturn’s biggest moon. “While temperature, gravity and wind conditions on Titan mean that energy production efficiencies are generally lower than on Earth, Titan’s wealth of natural resources nevertheless imply that energy production is a significant possibility,” conclude the researchers.